Commonly referred to as the Lenten Rose, the Ivory Prince is a fast-growing hellebore. It is characterized by its uniform growth, and compact, upright traits. It features burgundy-pink buds set in white blooms. The flowers grow facing out and upwards from the plant. These bloom in winter through to mid-spring. The foliage is deep green tinged with silver veining. These plants remain compact all through their lifespan. Also called the Heborus Orientalis, this perennial flowering plant is part of the buttercup family. It is native to Turkey and Greece. Named for their flowering during Lent, they have a long blooming season. They bloom for six weeks and sometimes more beginning in winter. This is an excellent plant for naturalizing in wet woodland soils. Their extensive root system will spread as far as you allow it to. They grow up to heights of 12” and will spread as wide as they are allowed to. The Ivory Prince requires rich soils and deep and regular watering during the planting season to develop its roots. Once this is done you may reduce the watering frequency but only if they are planted in cool and shady garden settings. They require full shade and are tolerant to filtered sun. Apply a layer of acid fertilizer after they bloom and protect their roots with a thick layer of mulch. 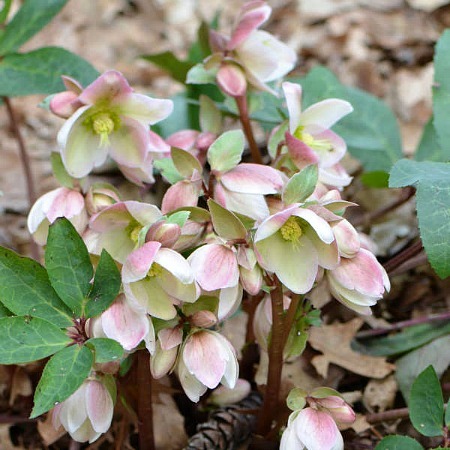 The Lenten Rose plant is bee friendly but it is deer and rabbit resistant. It is evergreen and makes a perfect addition to eclectic, Zen and woodland shade gardens. It can also be planted in pots and used as a patio plant. Asexual reproduction of this plant is strictly prohibited. Helleborus x hybridus 'Walhelivor' Plant Patent #16,199. Thank you to Walters Gardens for the lovely picture. Use it as a border plant or as a feature flower in your garden by mass planting it. You can also use it as a cut flower plant once in bloom. It makes an excellent companion plant to Coral Bells, Astilbe, Hosta and Bleeding Heart. Ivory Prince Hellebore is growing in a one gallon container. Orders shipping to AZ or CA will be bare rooted before being prepped for shipping.